How popular do you need to be for your music to inspire a series of vacation resorts? Jimmy Buffet’s hit song Margaritaville, like most of his music, is a story of living at a beach. It’s a popular fantasy; everyone likes to dream about going on vacation when feeling stressed out and run over by the rapid pace of life. 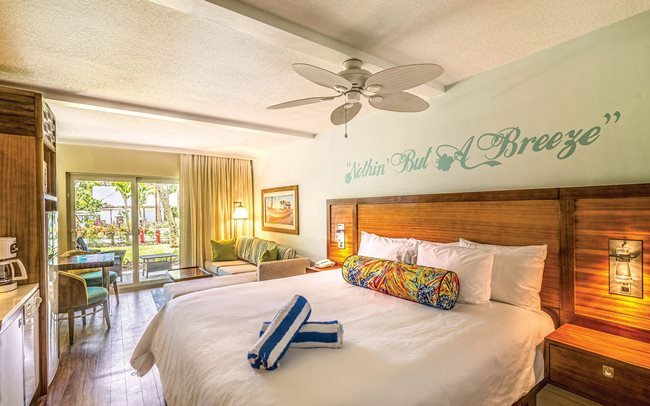 It’s a theme that’s defined a lifestyle for Jimmy Buffet fans, and with business acumen, Buffet’s music has inspired a series of tropical-themed restaurants, a casino, restaurant shops, and resorts. 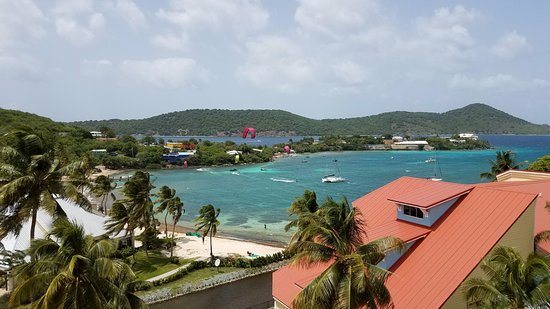 The Margaritaville Club by Wyndham, in St. Thomas, USVI, kindly allowed us to come write a review. 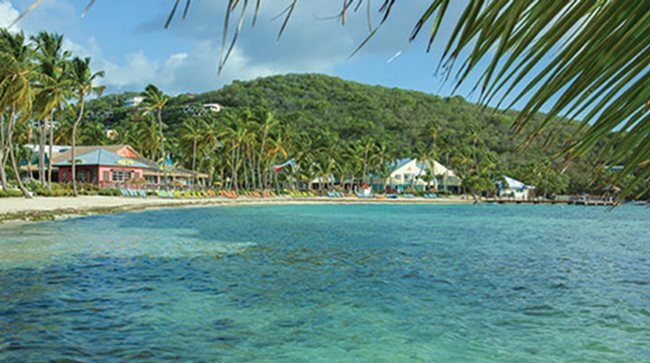 It’s a vacation resort encompassing timeshares for purchase, rooms for rent, pools and a beach, shops, and surprisingly the best restaurant in St. Thomas — the only restaurant that we chose more than once on our trip. I was skeptical at first of the island mentality that’s the central theme of Jimmy Buffet’s music. As a driven A-type personality, I don’t relax easily. To me, living life to the fullest means being creatively generative and active, seeking novel experiences. And while a drink once in a while is harmless, the implied alcoholism of Margaritaville put me off. There must be a higher aspiration in life than to sit around drunk and idle, letting life pass you by. The first thing they do when you arrive is to offer you a free margarita. The bar at the resort is titled after Jimmy Buffet’s hit song, “It’s Five O’Clock Somewhere”, which glorifies getting your buzz on at any time of day. But there are depths to Margaritaville, which I was glad to find is an idyllic resort, with plenty of amenities and great comfort, sited in a perfect location. While you could certainly spend your entire vacation at the resort, for us it was a launching point to adventures beyond. Just a short walk from Margaritaville is Coki Beach, one of the most popular beaches on St. Thomas. There you can snorkel, learn to scuba, or just sit and soak up the sun. Next door is Coral World, the only theme park in the USVI, where you can swim with sea turtles, swim with a sea lion, or go underwater in a simplified version of scuba that anyone can try. Arriving at Margaritaville, parking is easy, and you enter a nautical-themed lobby with a big compass on the floor. It was a bit theme park and overwhelming to see Jimmy Buffett’s portrait, five parrots that you can take photos with, and Jimmy Buffet lyrics on the walls. Checking in took more time than seemed necessary, but we were glad to hear that guests are assigned their own concierge to help them plan their stay. Pro tip: ask for a room with a view of the beach, if that’s your thing. 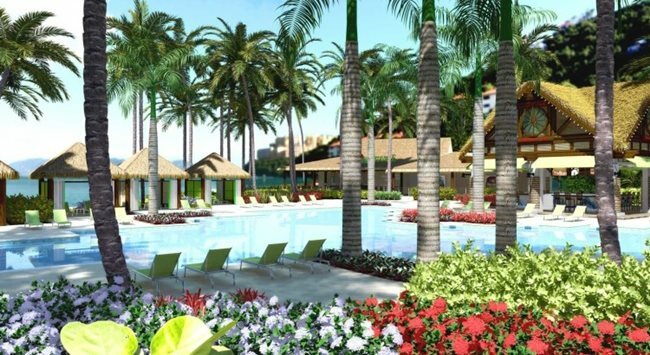 The resort is decorative, with bright, outdoorsy colors: green, yellow, and sky blue. You’ll find a surf board theme and real coconut trees all over. It has a hot tub, two shallow pools, the beach, stores, a gym, and more. Their calendar of events had some filler such as karaoke and forming a conga line in the pool, but you can also catch an outdoor movie or enjoy the live music at the outdoor stage. The grounds are pristine and well taken care of. You’ll often find landscape workers cleaning up weeds, and there are golf carts near every building in case you need help with your luggage. You’ll see wild iguanas roaming everywhere, but they won’t bother you. While manicured and themed, the tropical feel of this place remains healthy, not too packaged. With Margaritaville being a hit from 1977, many residents were of a certain age, but despite being younger, we didn’t mind at all. In fact, it was nice to be far from the shouting of children of family-oriented resorts such as Bolongo Bay. Despite the alcohol theme, Margaritaville is not a place with raucous college students. It’s surprisingly quiet, day or night. Central to the place is an open-air bar and restaurant, and the drinks were inexpensive. The view from the pool, beach, and restaurant is stunning. You see ocean water, with far off island mountains. It’s impossible to resist and I found myself relaxed despite my go-go nature. In your room, the Wyndham Margaritaville has really thought of everything, all the little amenities. The room is large and upscale, seeming proof to insects. You’ll have your own porch with deck chairs, a comfortable bed, a miniature kitchen including plenty of dishware for entertaining, including a dishwasher, and there’s even a seat in the shower. The laundry is free and open 24 hours, a wonderful discovery for weary guests who need to freshen up. You’ve got air conditioning but also a ceiling fan. The heavy theming of the resort, for example with song lyrics on the walls and Buffet-related artwork in the room, was overdone. However, the resort does have sophistication in their attention to little details and the complete comfort you’ll find there. We learned that Margaritaville is a state of mind that’s more than drinking. It’s a laid-back attitude. Thinking “it’s five o’clock somewhere” also means that the work day is over and it’s time to have fun. This Caribbean attitude can be found all over St. Thomas and Margaritaville is the embodiment of it. We stayed at several resorts in the US Virgin Islands and no other had as much support infrastructure. 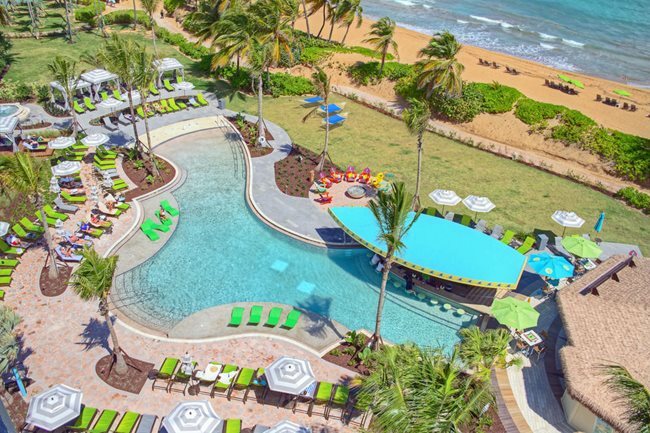 This makes Margaritaville (like many resorts) a bit of a bubble, but a perfectly curated one that is placed directly next to two of the best attractions in St. Thomas. Margaritaville, you have turned a skeptic into a believer. I’ll give Margaritaville Vacation Club a perfect 5 stars. See margaritavillevacationclub.com and read my review of their Margaritaville Restaurant (5 stars PLUS).